IWASSA Co.: LinkedIn network launches a new design of profile pages for portable devices launched the "LinkedIn"
LinkedIn network launches a new design of profile pages for portable devices launched the "LinkedIn"
a new design of profile pages for users to their applications and their location via mobile devices, in order to focus more on relevant information for users. She said the social network for business professionals, they rebuilt the way in which personal information users files for easy access by others quickly. She said the "LinkedIn" in a leaflet "your profile via ' LinkedIn ' is a professional identity, and is also the heart of ' LinkedIn '. And the new profile helps you tell your story to other professionals when they search for you via mobile devices. " Network focused on the new design of the optical element more as it became common links appears, in addition to basic information, such as name, company, job title, etc. 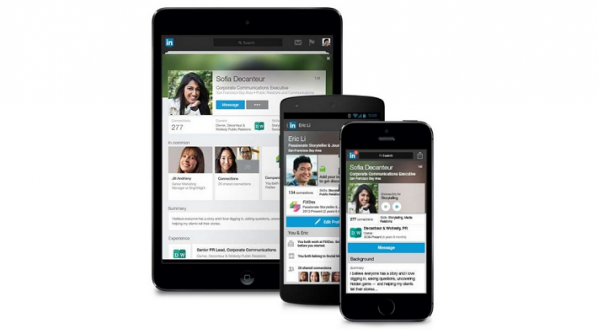 The company explained why the launch of the new design for mobile devices first, saying that they "force them to innovate and to rethink radically, focus, simplify the most important" at a time when you expect the "LinkedIn" to reach users who are communicating via mobile devices by more than half, compared to 8 percent recorded three years ago. This new design will, in principle, to portable devices with operating system "or as", to arrive soon to devices running Android and desktop version.